TL;DR Very few marketers will deny that video plays a significant role in advertising because of its captivating nature. Our tests have shown that video/moving images perform 3X better than still pictures. So we worked to create a suite of features that are designed to give you better performance quickly and efficiently. What it is: Our suite of video ad formats falls under one umbrella, Dynamic Video. It is how we describe our video ad formats that allow you to create videos at scale based on the data we collect from your product feed. Benefits: Create 10000's of videos by simply linking your product feed to ROI Hunter. Read more about Dynamic Video here. What it is: Our Video Collection uses the collection format from Facebook but allows you to add a video to the header image. Results: Our tests found that Collection ads performed better across most of the metrics with a higher CTR and lower CPC. Adding a visual aspect like video increased CTR by 3. You can read more about Video Collection here. What it is: Slideshow DPA leverages the power of the slideshow ad format but once again make it so that e-commerce stores will not have to create individual slideshows for their products. Results: What’s more, if you have multiple images of products on your website or product feed, we can extract them to display different angles of individual items in one slideshow. 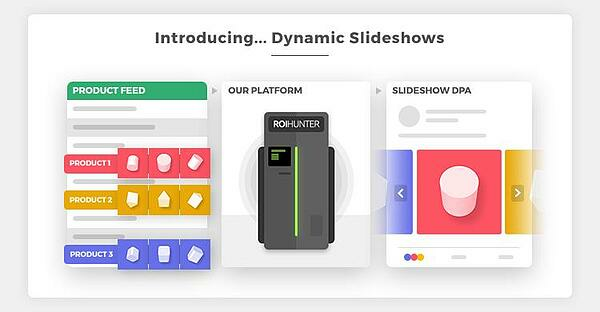 With dynamic slideshow, we have increased ROI by 75% and seen a 3X increase in CTR. You can read more about Slideshow DPA and use our tips to get better results here. What it is: All of the video formats that we developed can be created using our Integrated Video Editor. Just plug-in your product feed to ROI Hunter, select from several templates and create multiple iterations until you get the video that fits your need and then launch your campaign. In three simple steps, you can create video ads for every product in your feed. Benefits: Create video ads that are on brand and shows off more of your value proposition to potential customers. Learn more about how our Integrated Video Editor can help your business. If you are excited by what we can do for your e-commerce advertising, then reach out for a demo. If you’re an ROI Hunter client but haven’t started using these tools yet, contact your Customer Success Manager to learn how to start today. Marketing 6 minute read Why the human brain prioritises videos and how you can use it for advertising Technology 5 minute read Easily scale video ads production for e-commerce! Marketing 5 minute read IGTV - What Does This Mean for Performance Marketers?